Part I. Cities and urban systems: from theory to facts. Micro-foundations of urban agglomeration economies (G. Duranton, D. Puga). Evidence on the nature and sources of agglomeration economies (S. Rosenthal, W. Strange). Human capital externalities in cities (E. Moretti ). Theories of systems of cities (H. Abdel-Rahman, A. Anas). Evolution of city size distributions (X. Gabaix, Y. Ioannides). Urban political economics (R. Helsley). Fiscal decentralization (D. Epple, T. Nechyba). Sprawl and urban growth (E. Glaeser, M. Kahn). Factor mobility and redistribution (H. Cremer, P. Pestieau). Agglomeration and economic geography (G. Ottaviano, J.-F. Thisse). The empirics of agglomeration and trade (K. Head, T. Mayer). Agglomeration and regional growth (R. Baldwin, P. Martin). Knowledge spillovers and the geography of innovation (D. Audretsch, M. Feldman). Regional (di) convergence (S. Magrini). Spatial distribution of economic activities in North America (T. Holmes, J. Stevens). The Spatial distribution of economic activities in the European Union (P.-P. Combes, H. Overman). Spatial distribution of economic activities in Japan and China (M. Fujite, T. Mori, J. Henderson, Y. Kanemoto). Historical perspectives on US economic geography (S. Kim, R. Margo). The Historical geography of European cities: An interpretive essay (P. Hohenberg). 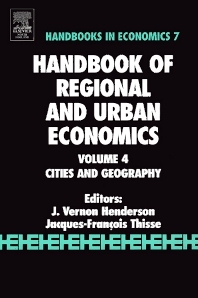 The new Handbook of Regional and Urban Economics: Cities and Geography reviews, synthesizes and extends the key developments in urban and regional economics and their strong connection to other recent developments in modern economics. Of particular interest is the development of the new economic geography and its incorporation along with innovations in industrial organization, endogenous growth, network theory and applied econometrics into urban and regional economics. The chapters cover theoretical developments concerning the forces of agglomeration, the nature of neighborhoods and human capital externalities, the foundations of systems of cities, the development of local political institutions, regional agglomerations and regional growth. Such massive progress in understanding the theory behind urban and regional phenomenon is consistent with on-going progress in the field since the late 1960’s. What is unprecedented are the developments on the empirical side: the development of a wide body of knowledge concerning the nature of urban externalities, city size distributions, urban sprawl, urban and regional trade, and regional convergence, as well as a body of knowledge on specific regions of the world—Europe, Asia and North America, both current and historical. The Handbook is a key reference piece for anyone wishing to understand the developments in the field. @qu:"The fourth volume of a handbook that provides comprehensive and accessible surveys of topics in regional and urban economics contains twenty papers that focus on cities and geography". @source: Journal of Economic Literature, 2005. @qu: "The contributors to the handbook are to be congratulated for making the insights from rigorous economic analysis accessible to people outside their fields. ...The handbook authors have translated and synthesized a huge volume of specialized economics research, transforming the suitably cryptic into the artfully transparent. @source: Journal of Economic Geography, 2006.